Now available in gold, silver, and space gray. Apple's iPhone 5s looks very similar to the iPhone 5, but add several new features such as a 64-bit processor, fingerprint scanner, improved rear camera, and new color options. Subscribe for regular MacRumors news and future iPhone 5s info. The iPhone 5s is the same size and design as the current iPhone 5 but features improved specifications and is available in three colors: Silver, Gold, and Space Gray. 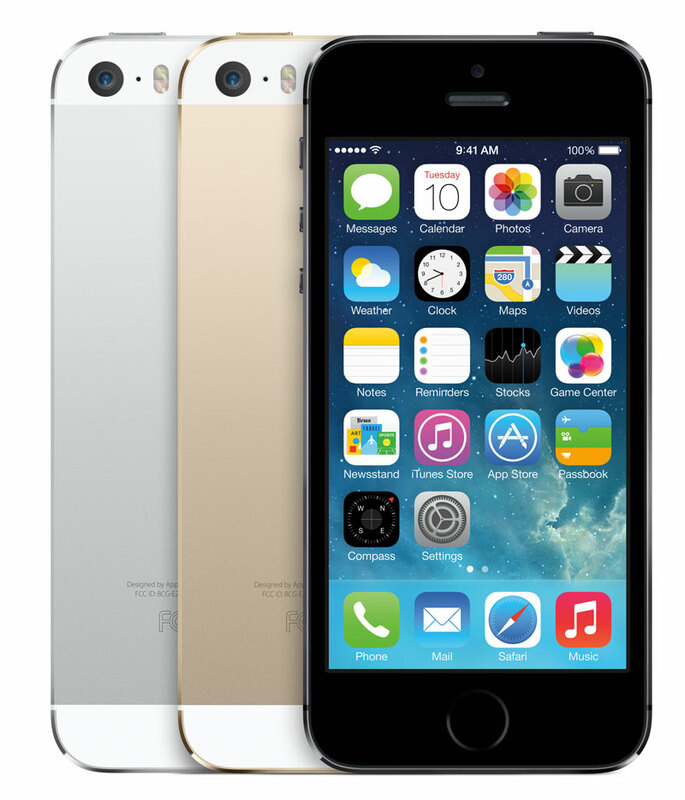 The iPhone 5s uses a 64-bit A7 processor which is as twice as fast as the previous generation. The new device also incorporates a "Touch ID" capacitive fingerprint sensor built into the home button that's capable of scanning sub-epidermal skin layers. 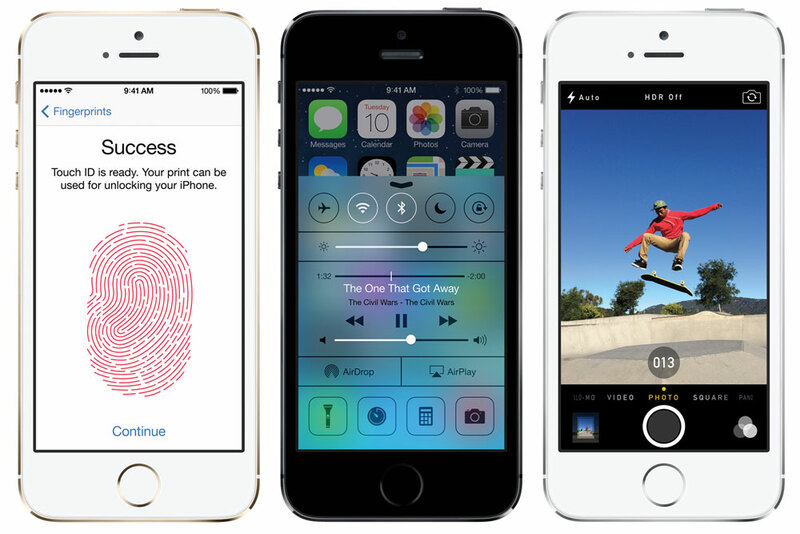 Touch ID can be used to unlock an iPhone and authorize iTunes purchases. Apple launched the iPhone 5s in the US, Australia, Canada, China, France, Germany, Japan, Singapore, and the UK on September 20, 2013. In the U.S., the iPhone 5s costs $199, $299, and $399 for the 16 GB, 32 GB, and 64 GB models respectively with a 2-year contract. Non-contract, unlocked SIM free devices are available for $649/$749/$849. Pricing for other individual countries is available on Apple's online store. Unusually, Apple did not offer pre-ordering as an option for the iPhone 5s. Instead, both in-store and on-line orders began on September 20, 2013. Online orders kicked off at 12:01 AM Pacific on that day, while retail stores opened at 8:00 AM local time. Stock of the iPhone 5s was somewhat constrained following launch, with the bulk of stock tending to go to Apple's own retail stores. Supplies were scarce in the weeks following launch, but as of early November, supplies began to improved with several colors and capacities of the iPhone 5s available for immediate pick up in Apple Stores in the United States. 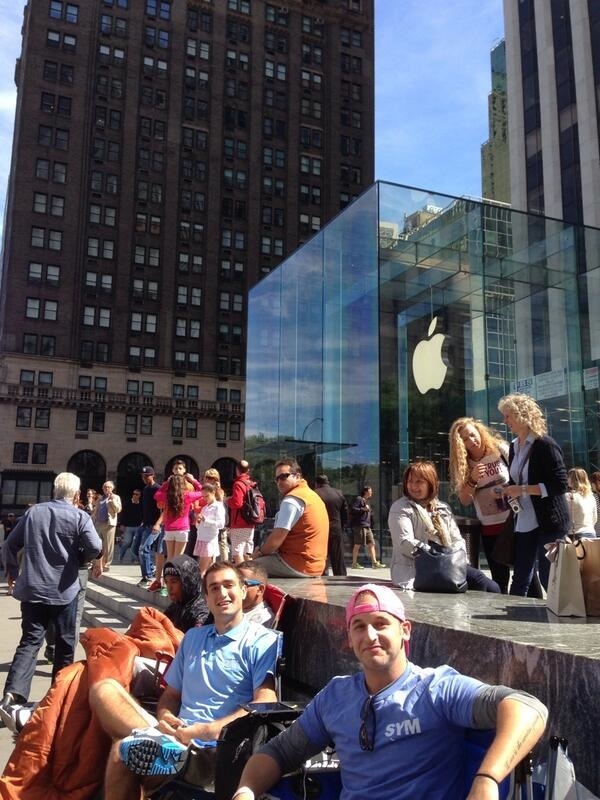 A recent survey revealed iPhone 5s supplies are seeing nearly 100% availability at Apple's U.S. retail stores. Online orders through Apple's site are currently being quoted shipping estimates of "within 24 hours" in most countries, indicating that supply-demand balance has indeed been reached. On Tuesday, September 24 the company began offering in-store pickup for online orders with model availability by store listed on the company's site. Though the option was briefly removed, it has since been reinstated, allowing users to reserve iPhones online to pick up in retail stores. A number of regional carriers in the U.S. and Canada, such as Virgin Mobile, began offering both the iPhone 5s and the iPhone 5c on October 1. Apple expanded iPhone 5s availability on October 25, bringing the phone to 35 additional countries. A third launch took place on November 1, bringing the iPhone to an additional 16 countries. In January, Apple CEO Tim Cook revealed that supplies of the iPhone 5s had been constrained in the United States because Apple underestimated consumer demand for the phone. As a result, the company was unable to achieve supply/demand balance until the end of 2013. Individual carriers have different rules on upgrade eligibility. In the U.S., customers typically sign two-year contracts to get the best "subsidized" price. Apple offers an online tool to determine if you are indeed eligible to upgrade your iPhone with your carrier. The iPhone 5s was made available to certain media outlets during the introductory press event. Apple has since sent out review units to specific media outlets who have published more detailed reviews. Apple has also highlighted select reviews of both the 5c and the 5s on its website. The early reviews have been very favorable. The new fingerprint sensor to be said to be both accurate and fast. TechCrunch wrote, "At first glance, it’s easy to dismiss the fingerprint sensor as a whiz-bang feature designed to attract eyeballs and do little else. But this isn’t that. The fingerprint sensor, unlike some other questionable recent smartphone tech like gesture control or eye-tracking, doesn’t feel like a gimmick or tech demo; it feels like a mature feature that actually enhances the overall experience of using an iPhone in a noticeable way that you encounter very frequently." The new camera is also receiving favorable reviews with improved low-light performance, burst mode, and slow motion mode. AllThingsD wrote, "All my pictures were slightly sharper than on the iPhone 5 and low-light pictures were much less washed out by the flash. The camera app has been improved, with a new burst mode that takes many shots quickly and then picks the best ones, and a slow-motion video feature that lets you choose parts of an action sequence to slow down. It worked seamlessly." Anandtech extensively benchmarked the new phone to show how it compares to others on the market. 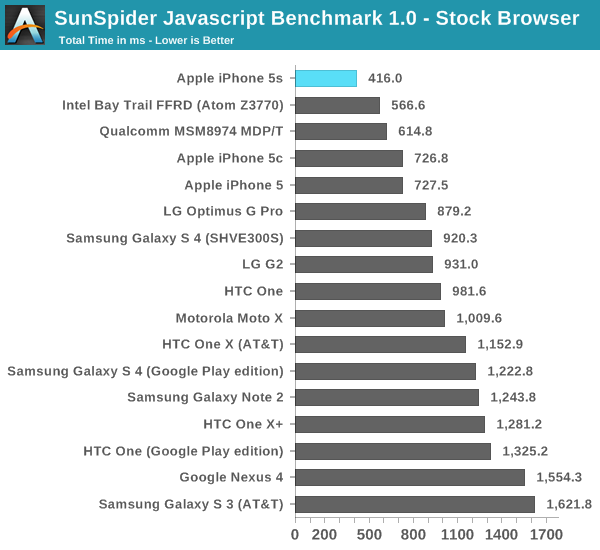 Meanwhile, DaringFireball performed various benchmarks to compare it with its predecessor, the iPhone 5. They found that the iPhone 5S was approximately 2x faster than the iPhone 5 on a number of CPU benchmarks. The new fingerprint sensor on the iPhone 5s has been getting most of the attention behind the new release. The early hands-on impressions have been positive, and Apple has clarified how it works in practice. Only the passcode can be used to unlock the iPhone after its been rebooted or hasn't been unlocked for 48 hours. This is reportedly to prevent hackers from trying to circumvent the fingerprint sensor itself. On September 22, the Chaos Computer Club managed to bypass Apple's fingerprint sensor using a photograph of a fingerprint to create a model, causing concern that Touch ID could be hacked by thieves. According to security expert Marc Rogers, who also completed the fingerprint bypass, the average consumer should not be concerned as the fingerprint bypass method requires a significant time investment and over a thousand dollars worth of equipment, putting it out of the hands of the average street thief. Apple recently released a statement indicating that a manufacturing defect was causing shortened battery life and longer charging times in some iPhone 5s units. According to Apple, only a small number of iPhone 5s devices are experiencing issues, and the company is contacting customers with affected phones (determined by serial number) to offer replacement devices. Customers who have not been contacted by Apple but believe they have a defective unit can contact AppleCare for a serial number check. Since the iPhone 5s was released, there have been widespread complaints about Touch ID's accuracy, which has been described as "fade" by some. The fingerprint sensor has a tendency to become less reliable over time, a problem that was rectified with Apple's iOS 7.1 update. With the introduction of the iPhone 5c and iPhone 5s, Apple has discontinued the iPhone 5, and kept the iPhone 4S as the entry level model -- free with contract -- iPhone. Apple maintains a comparison chart showing the differences between the models. In making a decision, much of it depends on how price sensitive a consumer you are, and how important your iPhone is to you in your day to day tasks. At this stage, it is hard for us to recommend the iPhone 4S to anyone more than a very casual and very price-sensitive customer. The 4S has the smaller 3.5" screen, and a slower processor -- it's already 2 year old technology, and will be 4 year old technology when your contract runs out. The iPhone 5c is based on last year's technology, but with this new refresh, that technology remains far more current. The iPhone 5c also incorporates the same 4" screen as the iPhone 5s and should support all software for the foreseeable future. The $99 starting point makes it a reasonable choice if the iPhone 5s features don't call out to you. The standout features of the iPhone 5s are the fingerprint scanner, faster speed and camera improvements. For serious smartphone users, these can be compelling features -- but for a $100 premium over the corresponding iPhone 5c model.